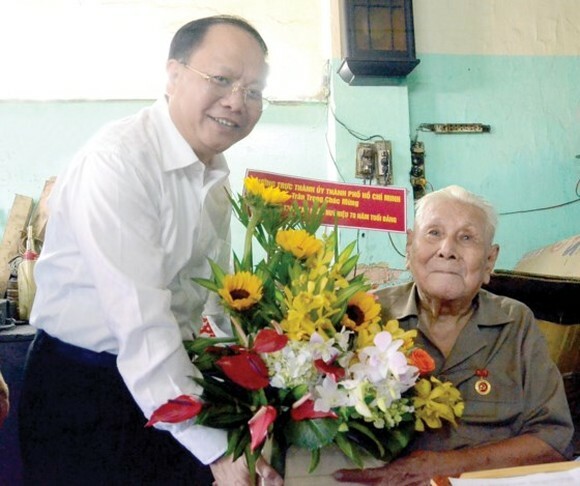 Deputy Standing Secretary of the Ho Chi Minh City Party Committee Tat Thanh Cang on September 2, on behalf of the Party and State, presented 70-year Party membership badges to three Party members in Ho Chi Minh City. Old Party members of District 10 include Pham Thi Nhon, 88 in the Ward 15; Ly Toan Anh, 90 in the Ward 5 ; and Do Yen Thai, 86, in the Ward 14. This activity aimed at acknowledging the dedication of elderly members in the struggle for national liberation and educating young people about revolutionary tradition of previous generations. Mr. Tat Thanh Cang acknowledged the dedication of elderly members in the struggle for national liberation and wished them good health.